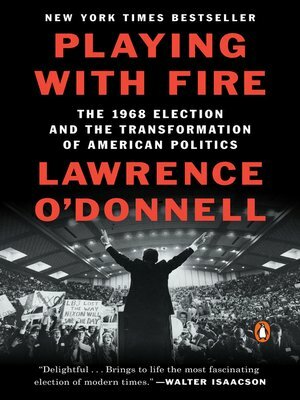 The 1968 U.S. Presidential election was the young Lawrence O'Donnell's political awakening, and in the decades since it has remained one of his abiding fascinations. For years he has deployed one of America's shrewdest political minds to understanding its dynamics, not just because it is fascinating in itself, but because in it is contained the essence of what makes America different, and how we got to where we are now. Playing With Fire represents O'Donnell's master class in American electioneering, embedded in the epic human drama of a system, and a country, coming apart at the seams in real time. Nothing went according to the script. LBJ was confident he'd dispatch with Nixon, the GOP frontrunner; Johnson's greatest fear and real nemesis was RFK. But Kennedy and his team, despite their loathing of the president, weren't prepared to challenge their own party's incumbent. Then, out of nowhere, Eugene McCarthy shocked everyone with his disloyalty and threw his hat in the ring to run against the president and the Vietnam War. A revolution seemed to be taking place, and LBJ, humiliated and bitter, began to look mortal. Then RFK leapt in, LBJ dropped out, and all hell broke loose. Two assassinations and a week of bloody riots in Chicago around the Democratic Convention later, and the old Democratic Party was a smoldering ruin, and, in the last triumph of old machine politics, Hubert Humphrey stood alone in the wreckage. Suddenly Nixon was the frontrunner, having masterfully maintained a smooth façade behind which he feverishly held his party's right and left wings in the fold, through a succession of ruthless maneuvers to see off George Romney, Nelson Rockefeller, Ronald Reagan, and the great outside threat to his new Southern Strategy, the arch-segregationist George Wallace. But then, amazingly, Humphrey began to close, and so, in late October, Nixon pulled off one of the greatest dirty tricks in American political history, an act that may well meet the statutory definition of treason. The tone was set for Watergate and all else that was to follow, all the way through to today.